‘Engaging’ on social media is not the end of the story. Your business needs to be able to follow-through or you risk creating negative brand equity. Recently I was on Twitter chatting about an upcoming academic paper I needed to write. I tweeted to a fellow masters student that I thought a particular company might be a good example for my research. I was impressed. I hadn’t hash-tagged or used their company @handle in my Twitter conversation so clearly they were using effective monitoring tools to manage mentions and conversations. The response was reasonably timely and friendly, they offered to put me in touch with someone who could help with my research. I replied with my email and waited. Nearly a week later I tweeted a reminder and was given an email address to use. So what‘s the problem? Afterall, I could have (and did) look up the email address myself. Well, non ‘follow-through’, particularly from a business, is usually a sign of a broken channel somewhere. And that can result in unhappy customers. So what is a broken channel? A broken channel most often happens when the social media department of your business works in isolation or as a tacked-on part of your process. The social media manager/team work hard to build brand awareness and community (common social media goals) by identifying and responding to online mentions and requests, which they then funnel to the right departments internally. 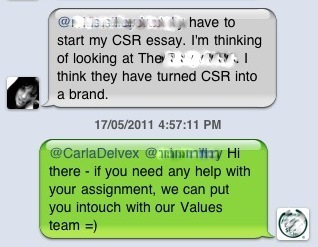 Leads go to sales, quality control goes to customer service, information requests about CSR to the ‘values team’ etc. The expectation then is that the appropriate internal department handles the query in a timely manner, except, and here is the “broken” part of the channel, the request ends up sitting in someone’s inbox or in-tray under a pile of other work to do. So what can you do to avoid broken channels? If you get it wrong–fix it. Social media is a valuable investment. But if not managed correctly it can be very costly to your brand. In the above case the solution might have been as simple as the tweet containing the email address in the first place. One Response to "Is your social media channel broken?" So many businesses have this problem!